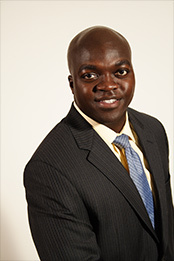 Dr. Augustine Conduah of DeKalb Medical joins us on Feb. 26 for our first Sports Medicine Special. Whether you are a well-conditioned athlete or a weekend warrior, Dr. Conduah will provide you with valuable injury prevention tips. Augustine Conduah, M.D. brings a high level of experience and medical training to the community through his office, DeKalb Medical Physicians Group Stonecrest Orthopedics and Sports Medicine, conveniently located across from the Mall at Stonecrest in Lithonia, GA.
Dr. Conduah is a member of the American Orthopedic Society for Sports Medicine and the American Academy of Orthopedic Surgeons. He completed his fellowship in sports medicine at the Hughston Clinic in Columbus, GA, a world leader in orthopedic and sports medicine research, education and treatment. He is a member of The Hughston Society, a group orthopedic surgeons and other physicians who are bound by a genuine concern for athletes and a desire to help them return to competition injury free in the shortest amount of time. Prior to becoming a Hughston fellow, Dr. Conduah completed his residency in Orthopedic Surgery at the University of California Los Angeles (UCLA). He earned a Doctor of Medicine from UCLA as well at the David Geffen School of Medicine, where he was named a Leonard Marmor Foundation scholar and received a Letter of Distinction in Surgery Clerkship. When Dr. Conduah isn’t in the operating room performing knee replacement surgery or reconstructing torn anterior cruciate ligaments (ACL) or seeing patients in his office, he’s out serving in the community. Whether it’s educating weekend warriors or those suffering from arthritis, Dr. Conduah routinely presents community seminars to inform people on the latest advances in pain management, and injury prevention and treatment. He is the team physician for the athletics department of Arabia Mountain High School in Lithonia, GA.
“I focus on educating patients about their condition in order help them achieve the best results possible”. For some people that means simply not being in constant pain, and for others it may mean being able to play sports again and getting back into action” shares Dr. Conduah, who treats all types of musculoskeletal issues. Dr. Conduah lives in Sandy Springs with his wife and three children.